A penthouse is a luxurious living space in the highest level of a building. More often than not, these are considered the most expensive when it comes to residential unit spaces. Most penthouses have dream pool areas that match the urban and modern setup of the building’s location. If you have browsed through photos of penthouse pool decks, the thought that probably entered your mind is that it looks costly. They really are. But you can recreate the same look in your home at a much lower cost. 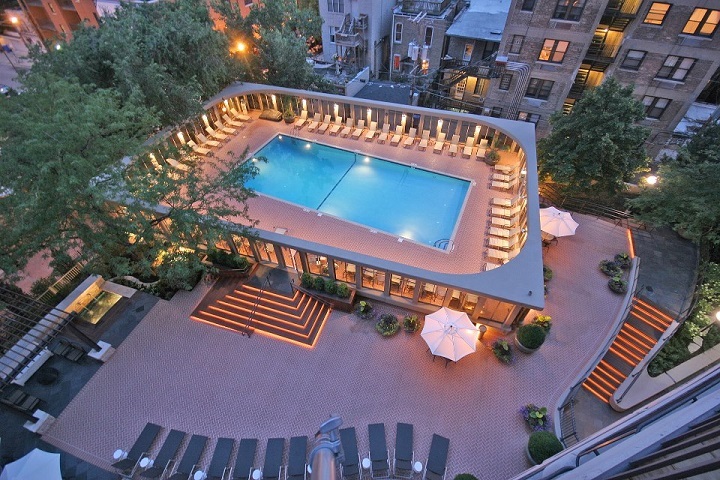 Most penthouses have simple swimming pools, often in geometric shapes. Although the design is minimalist, the material used is what makes it expensive. Glass, porcelain tile, and wood. You can have the same minimalist look with concrete. Choose a square or rectangular pool, none of the curvy, kidney-shaped pools common in residential properties, and then use decorative concrete pool deck options to make it look expensive. Tile and wood can be replicated with concrete stamping. Fiberglass can be an alternative to real, breakable glass. The great thing about pool deck resurfacing and refinishing is that you can acquire just about any look on a pool deck using just concrete. To mimic the contemporary look, stain the concrete pool deck with a light blue or gray hue. You can choose to polish some areas of the deck where foot traffic is low to give a steel-like impression. You may also stamp an overlay on the deck with a modern pattern like ashlar. A chaise lounge is an upholstered chair mostly used on pool decks. It is known for being long enough to support the legs and with a reclining back support. These are quite pricey so, as an alternative, choose pool deck chairs made from plastic, wood, or wicker. Incorporate an upholstered look by adding throws or pillows. Fireplaces and fire pits are trending features in pool decks nowadays. Fire pits are more practical since they are smaller and they come in portable types. Some are large enough to be placed amidst outdoor seating elements while some are tabletop types. You can even build your own with concrete. One of the most notable features of penthouse pool decks is the amazing view the city below them provides. You can recreate this by adding dramatic lights around the pool area. String lights can be hung on trees or hung in a canopy-like way above the pool itself. For a more interesting concept, use tiki lights around the pool area. If you have a wall near the pool, why not have a cityscape mural painted on it? Now, that is creative.